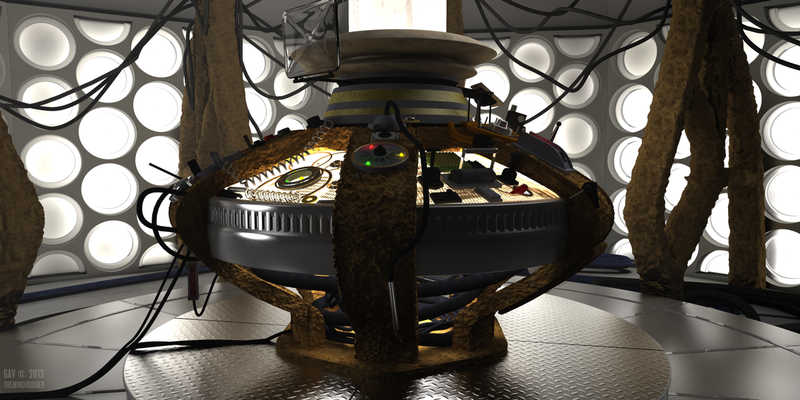 I love this fleeting new thing created for the fiftieth anniversary so what better tribute to this little gem than to rustle up some artwork of this interesting TARDIS console. John Hurt and company enter the Tenth Doctor's TARDIS, only to find it glitches into something we've never seen before. 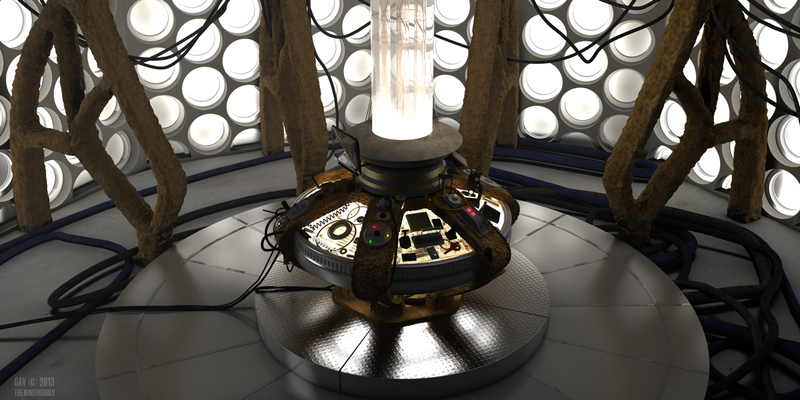 John Hurt's Other Doctor has a new Console Room! "The round things are back!" - "I love the round things!" Yes, we all love the round things. For the 50th Anniversary episode The Day of the Doctor, it seemed that for a moment we were going to see a sequence inside the Tenth Doctor's TARDIS - "His grunge phrase" as it was put. But no - a glitch of the Desktop Theme system and suddenly we're treated to the round things after a 24 year absense. 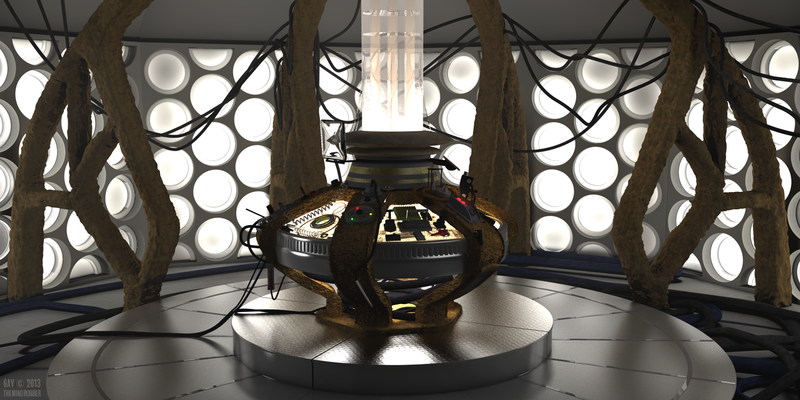 Here's my 3D render of the set. Build and rendered in Cinema 4D. The console itself was a recycled prop from an exhibition, whilst the roundels were borrowed from the set of the "William Hartnell TARDIS" used in An Adventure in Space and Time - before they were shipped off to the Doctor Who Experience in Cardiff. The fusion of the two elements is strangely gratifying. It shouldn't really work but, for me, it does. The metal rim of the console helps to sell the idea of the different elements of the walls. The pipes around the outside echo those that were in the 2005 set, however the fact they're laid out on a studio floor rather than a built-up gantry adds to the nostalgia of the classic series. I wonder, if we had seen inside the Eight Doctor's TARDIS in Night of the Doctor what kind of design we might have seen.